There were three bikes to choose from at the cottage last summer, but Free Spirit was the obvious choice. I was training for my first triathlon and needed to stay in shape. Past visits to our place on Star Lake had always been a time for me to reconnect with family and recharge while lounging on the beach and filling up on barbecue lunches and afternoon snacks. I was determined that this year would be different. But I had done maintenance on my other bikes, changing tires and adjusting gears, and I was pretty sure it could be fixed. I consulted YouTube and phoned a friend, and that afternoon, with a smear of grease on my face, I had repaired Free Spirit. She was gearing like a new bike, or at least a functional one. I was in Muskoka, Ontario’s cottage country, named for the Ojibwe Chief Mesqua Ukee, translated as “not easily turned away from battle.” Early settlers must have felt like etching a life out of this wilderness was itself a battle, particularly on the insect front. Summer is marked by three micro-seasons: mosquito, deer fly and horsefly. In past years, attempts at running along the cottage road showed me the mosquitoes had the obvious advantage. But on Free Spirit I finally outpaced them, riding just fast enough to keep ahead of the swarms among the stands of maple, white birch and oak trees that line the King’s highways and secondary side roads. Over the next two weeks I wheeled off on short adventures, stopping with Free Spirit to take photos of historic landmarks along these Muskoka roads, places I had driven by in earlier summers but had never seen from this cycling vantage. On a bicycle, you become more tuned in to birds playing over a marshland or to the whispers of long grass in the wind. The rain comes down heavy here, making the greenery lush; the brown-tinged lakes can be overfull even in July’s heat. The delicate shades of green along the side roads are light and vibrant against the blue horizon, while pink granite outcrops line the rocky shores. On a bike, the experience is slower; you become a part of the environment. My long, comfortable country rides were a welcome change from the previous month, which I had spent training on my sleek new racing bike back home in British Columbia. 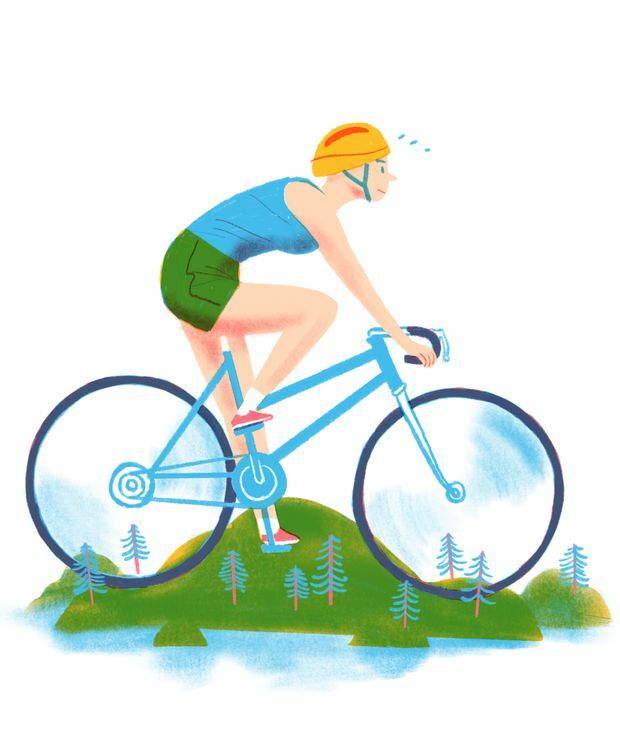 I had learned to navigate the challenging West Coast roads, sometimes riding downhill at high speeds, at other times crawling up steep mountainside grades, trying to increase my speed and endurance, readying myself for the race ahead. These Ontario rides were relaxed, the few hours away from the cramped cottage providing time to reflect on the changes I’d been going through recently after leaving 15 years of marriage. For the last six months I had been awakening, getting reacquainted with the person I was back when I had the freedom to be myself. I was reading the poets I had loved in my younger days, and found my own new words were weaving themselves together in my head as the kilometres began to fall away. These rides were gentle. I could stop pushing, stop struggling. Riding these flat country roads, my mind cleared and I settled into a quiet meditation, making way for the words and the patterns they created. The repetition and the cadence of the ride worked together to form one lyrical line, and then the next. I was 18 the last time I had written anything other than a business letter. Here, in this place of my childhood, I was finding the poet I had once been – the voice I had too long ago forgotten. I found a tempo to those Muskoka roads. Though I had driven them before, there was something new around each bend, an excitement that grew with each passing kilometre. I knew it was not the land that had changed; it was the way I was seeing things. It was on these short adventures that I also found my touring legs. I wasn’t training – I was travelling. There was no need to check my kilometres per hour. There was no one coming up behind me or waiting ahead; the road was mine. I’ve since done a number of long cycling trips, many overnight and alone, but Muskoka was where the seed was first planted, to keep moving and writing about the things I learn along the way. Friends and strangers often ask why I would venture out into the world with nothing but a bike, a map and a few supplies. The answer is simple: It’s the one place in the world where I am not solving problems. No matter what is happening at home or abroad, it’s just me, two wheels, an open mind and a strong heart. When problems arise, I fix them. When tired, I rest. Hungry, I eat. And when broken, I repair. Julie Bell lives in Nanaimo, B.C.